Opened in 1993 and relocated in its current location that was once Le Cirque in 1999, Daniel is the quintessence of what fine dining means: an incredible experience from beginning to end where hospitality has a real meaning. Some might be intimidated by the place and the omnipresent service, but the fact that it is not stuffy and very welcoming gives a different vibe to this culinary institution. There, Executive Chef Jean-François Bruel, Chef de Cuisine Eddy LeRoux and Executive Pastry Chef Ghaya Oliveira crafted sublime menu where you will not find classic dishes: no, it is more French inspired than typical French dishes, where ingredients like foie gras, Lapin (rabbit) or pigeonnau (squab) can be found. And if you are vegetarian, this is not a problem: they have a vegetarian menu. Amuse bouche: black onion-parmesan sablé with olive tapenade, tomato confit and Mornay emulsion. Then we got a tasting of cucumber: we both had the same, except that mine had seafood in it. For me: smoked salmon with cucumber noodles, Nettle oil and dill yogurt. For Jodi, also cucumber noodles, with Nettle oil. In the middle was a cucumber soup that we both got, made with Meyer lemon, pickled cucumber and chive oil. For Jodi, an equivalent, but I admit that I forgot with all these yummy descriptions! For Jodi, Carotte, a chilled carrot velouté with a chermoula cream, lovage oil and confit ginger. I should mention that Jodi does not like carrots: well, you could not tell as she loved it! I got the Lapin, a rabbit "porchetta" with chorizo, yellow wax bean and haricot vert salad, a quite comforting dish. Then I got the Saint-Jacques or ceviche of Maine sea scallops, served with an avocado mousseline, white sturgeon caviar, finger lime wasabi vinaigrette and cilantro. This was exquisite: the scallops literally melted in my mouth and I loved the addition of the avocado mousseline that gave a nice smoothness and fattiness to the dish. Third course: Broccoli for Jodi, that was grilled broccolinis, old Chatham yogurt, Thai basil chutney and Purslane (a leafy vegetable) salad. Gambas for me, a Santa Barbara Spot prawn "a la plancha", served with a Country Line melon, day lily, honeysuckle-togorashi infused oil. It was good, the prawn being well cooked, and the melon adding a refreshing element to the dish that had a nice kick, but I found it slightly salty. The fourth course was, for Jodi, compliment of the Chef, the Choux Fleur, a Vadouvan roasted romanesco cauliflower with a saffron dubarry cream, grape-caper brown butter and California green almonds. On my side, it was the foie gras that they flambéed in front of us in Mezcal and served with grits, corn in may forms (including pop corn and corn bread!) and sumac. This was fantastic: foie gras sauté is so decadent and scrumptious. 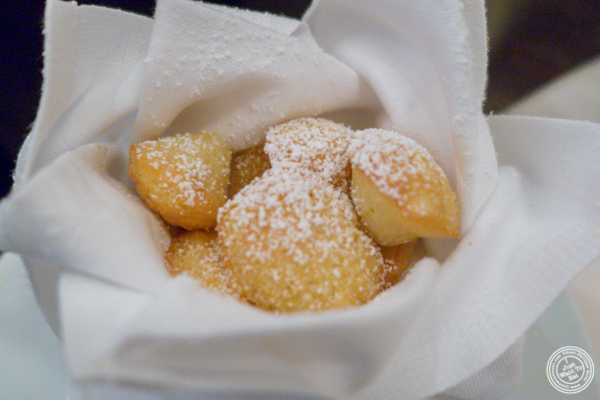 I loved the sweetness the corn gave, counterbalancing the fattiness of the foie. I definitely recommend this dish. For the fifth course, I decided to have a glass of red wine and picked a 2010 Chateau des Fougeres Clos Montesquieu from France, a full bodied Bordeaux beautifully balanced. It was perfect to accompany the quail (caille) that I had. 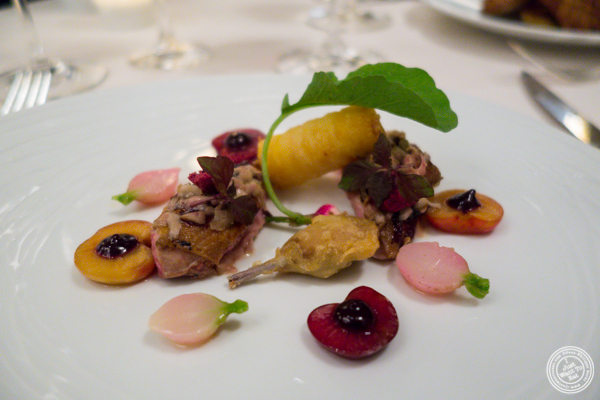 It was the breast of the quail that was served, roasted, served with Bing and Rainier cherries, Easter egg radish, crispy potato "Bellecour" and a Montmorency sauce. That quail was so moist, it was amazing as it can be tricky to cook (overcooked, it is dry). Jodi got the Trompette Royale or roasted king trumpet mushrooms, porcini coulis, red pearl onions, turnip and lava beans leaves. Bolivie, a dark chocolate moelleux, served with infused balsamic vinegar, chocolate gavottes for a bit of crunch and spiced herb ice cream. Abricot or a cake made with vanilla roasted apricots, ginger Chantilly, chia seed Arlette, creamy chai and oatmeal ice cream. Fraise or strawberry tart with Elderberry flower gelée, berry vinaigrette and a fennel-yuzu confit sorbet. This was my favorite with the moelleux: not only it was beautiful with the sugar tuile on top, it was very refreshing and had nice flowery notes. I just wished it was bigger, because I could have eaten more!